Matt Sweet Blog: A Christmas Carol: A model of psychotherapy? I was working on my holiday cards the other day, which is mostly a mindless task. To keep myself entertained while addressing, folding, stamping and sealing, I was watching the 1984 version of A Christmas Carol, staring George C. Scott. I always enjoy this movie, and usually watch it once a year. Apart from Scott's excellent portrayal of Ebeneezer Scrouge, and apart from the lush sets, I find the story to be an outstanding example a course of psychotherapy. I am sure that I am not the first person to recognize this, but I think that it is nice this time of year to remember that Charles Dickens foreshadowed modern psychotherapy in his short story. So what can we learn from looking at Scrouge's journey to mental health? Well it usually starts with feeling that there is something that needs to be changed or resolved. In Scrouge's case, he receives a great existential wake-up call in the form of visitation from his former partner, Jacob Marley. As you remember, Marley was a man of great achievement in business, but as much (or more) of a miser as Scrouge. For his part, Scrouge had admired Marley's mind for business. But when Scrouge reminds Marley of his work ethic, Marley's restless ghost reflects on his priorities in life: "Mankind was my business. The common welfare was my business; charity, mercy, forbearance, and benevolence were, all, my business. The dealings of my trade were but a drop of water in the comprehensive ocean of my business!" Think of this as the intervention: Scrouge's friend--the only one he has in the world, as Dickens describes him as "solitary as an oyster"--tells him that he needs to change because Marley is worried about him. Scrouge is then famously visited by three spirits. The first, the Spirit of Christmas Past, takes him to his childhood. He visits his old school and confronts his overbearing father, who we learn bears Ebeneezer a grudge because his mother died in his birth. We are reminded that Ebeneezer's beloved sister Belle died in the childbirth of Ebeneezer's nephew Fred, whom Ebeneezer spurns. We see the family patterns repeating here, and we begin to understand why Scrouge thinks and acts the way he does. Further, we notice that Ebeneezer's upbringing was weak in attachment and empathy. He was not socialized in a loving family, but was turned over to a boarding school. This surely impacted both his ability to form bonds with his fellow persons and also possibly helped shape his work ethic, since schoolwork was valued above human attachment. We also learn that young Ebeneezer longed for human contact--he references his "beloved books" as though they were friends, in denial of the actual emptiness of his youth. The Spirit of Christmas Past then shows Scrouge a scene from his time at Fezziwig's, in which Scrouge was happy and celebratory. Scrouge was surrounded by love, joy and human connection. For a moment, it looks like Scrouge has cast off his past of isolation and loneliness, and learned how to have satisfying human relationships. But there are underlying currents of discord: Fezziwig warns Scrouge not to put too much energy into his work, and to focus on finding a partner and starting a family. The Spirit of Christmas Past is not done, as the process of excavation in therapy is often lengthy. She then shows Scrouge the Christmas eve in which Belle left him, as a result of his prioritizing his work over her. Scrouge becomes so distraught he refuses to see any more memories from his past. He attempts, as do many people, to put the blame for his unhappiness on the person who is reminding him of the memories that he would rather keep burred. But The Spirit of Christmas Past leaves him with a wonderful therapeutic sentiment: "You fashioned these memories yourself," reminding Scrouge that he must take ownership of his own life. The Spirit of Christmas Present shows Scrouge, over the course of several scenes, the joy and love that exists in the here-and-now that Scrouge is refusing. They see the market place and children playing. Scrouge first sees only the money being transacted, and then is instructed by the Spirit to see more than that--to see the humanity all around him. Scrouge and the Spirit visit some of the citizens of London who are not as fortunate as Scrouge and his family, and even then Scrouge sees the love and connection as well as the hardship that Scrouge himself refuses to see. In this way, Scrouge confronts his privilege as well, and beings to think of his social responsibilities. The Spirit of Christmas Present also takes a hard look at the way that other people view Scrouge: Cratchit and his family discuss Ebeneezer, as do his nephew and his party guests. They are not favorable in their assessment of Scrouge. At first, he defends his reputation, but as more and more evidence is gathered, his defense mechanisms begin to quiet down and he beings to see the reality that he is perceived to be a tight-fisted miser by others. Finally, the most frightening apparition is the Spirit of Christmas Yet-to-Come. This Spirit will not speak to Scrouge, but forces him instead to draw his own conclusions, to make his own explanations. The focus this time is on Scrouge's death. The existential therapy here has been remarked on by many other clinicians: Scrouge must face and acknowledge his own death and his legacy. He must fact the fact that he is not grieved: The only person showing some emotion in relation to his death is a cleaning woman who is pawning his possessions. In contrast, Scrouge and the Spirit visit the Cratchit family, where Tiny Tim has died and is still grieved and missed. Scrouge is deeply shaken by this, and in terror he confronts his own lonely grave in a cold cemetery. At the end of Scrouge's therapy (The spirits did it all in one night! Imagine how managed care would love that! ), he makes a commitment to behavioral change, and engages that change. He finds that the real benefits of therapy come as he manifests real change in his life. Insight motivates the change, to be sure, but it is the generosity and kindness that he consciously engages that redeems Scrouge. I encourage anyone who has any interest in mental health to watch whatever version of A Christmas Carol that appeals, and to notice the ways in which Dickens shrewdly lays out the workings of the human psyche. In particular, notice all of the interventions used on Ebeneezer Scrouge that are used in psychotherapy today. Apart from making a case for Dicken's deep understanding of human behavior, it shows that the great works of literature and art have much to teach when it comes to mental health and psychotherapy. Nicely analyzed (pun intended... sorry). 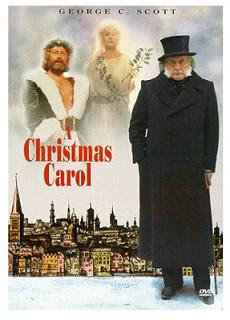 The '84 George C. Scott version is my favorite film version of "A Christmas Carol" as well! Scrooge's time with the silent Ghost of Christmas Yet-to-Come also strikes me as highly initiatory (in a magickal/spiritual sense) in that it is a confrontation with mortality, a symbolic "death" and "rebirth" experience (Scrooge gets to experience his own "death" and the gratitude of being spared and returning to his life) and the existential meeting with the void/abyss that is death and an unknown future and the need to fill it with meaning, which ultimately must come—not from the silent spirit—but from Scrooge himself. He's forced to draw his own conclusions and choose his own fate. No surprise ceremonial magician Israel Regardie recommended therapy (the work of the first two spirits) before embarking on a course of initiation.